The Chamber Champions for Nonprofits program began in January 2016. 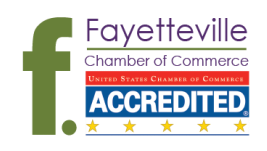 We understand that our nonprofit members have different needs and means for doing business than our for-profit chamber members. This program was developed with those differences in mind. The Chamber Champions program supports the growth of our nonprofit chamber members by encouraging our chamber staff to volunteer with member nonprofits, sharing their stories and promoting the nonprofit efforts within the business community. Chamber staff are allowed to donate up to eight hours of their time every 90 days and share their story on the Chamber blog.